COPD is very common today and holds many other respiratory illnesses under its umbrella. Find more about it, about symptoms and natural ways to help relieving associated symptoms and COPD treatment. COPD stands for chronic obstructive pulmonary disease and is a long-term lung disease. It is also known as chronic obstructive airway disease (COAD), chronic obstructive lung disease (COLD) or chronic obstructive respiratory disease (CORD), and is defined by poor airflow in the lungs, often caused by smoking. The persistent poor airflow in COPD is a result of the breakdown of the lung tissue so that the small airways are not able to work properly. As a result shortness of breath (breathlessness) is the main symptom, persistent cough, accumulation of green sputum or mucus / phlegm in the lungs that can cause repetitive lung infections and tiredness (fatigue). These symptoms are an indication that the lungs are not functioning properly. COPD is primarily caused by smoking and tobacco smoke or long term second hand smoking and air pollution that cause persistent inflammation response in the lungs and the pulmonary function test will indicate abnormal functioning of the lungs and low airflow. Contrary to asthma, these limitations are not reversible and get worse in time. Management includes quitting smoking first and pulmonary rehabilitation, inhaled bronchodilators, long-term oxygen therapy and even lung transplantation. COPD is the third leading cause of death in USA and sixth worldwide, expected to increase due to increase smoking and air pollution. Coughing is the first symptom to appear and if it lasts more than three months per year, for more than two years, the condition is defined as chronic bronchitis. Chronic bronchitis can appear before COPD is totally installed. Shortness of breath is usually the most bothered symptom and is typically of prolonged duration and worsened over time and with exercise. This cause anxiety and poor quality of life; low oxygenation of the blood influence the functioning of the whole body and many other conditions co-exist with COPD: heart diseases, hypertension, diabetes, anxiety disorders, etc. 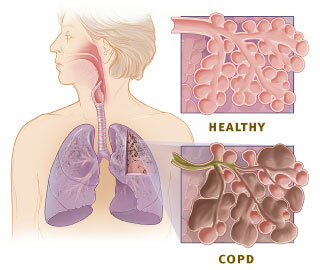 COPD includes chronic bronchitis and emphysema and many people with COPD have both. There is no cure for COPD. Classical medical treatment for COPD is management of the disease by reducing the risk factors, stabilize the disease by preventing and treating acute exacerbation and reduce mortality by smoking cessation and oxygen supplementation. Pulmonary rehabilitation is a program of breathing exercises and disease management and counseling. Medication involves bronchodilators to reduce shortness of breath and corticosteroids to reduce inflammation and prevent acute exacerbation. A natural treatment for COPD involves supplements, vitamins and home salt therapy. Long-term treatment with salt therapy for COPD can slow the evolution of the disease, beside helping with the respiratory symptoms. Ginseng is a herb with long history in Chinese medicine and it has shown some results in COPD and improving lung function. This herb should only be taken after consulting with a doctor because it interferes with some medication such as blood thinners, diuretics, stimulants, immune suppressant drugs and antidepressants. It was found that many people with COPD do not have enough vitamin D. This can be because not enough sun exposure (not enough time outside), age is another factor because in older people vitamin D production lowers, and probably poor oxygenation of the blood due to COPD also play a role, beside diet. Supplementation with vitamin D has been linked to better lung function test results and may improve symptoms.